A large and diverse audience came out on a Friday night to hear the Indo-Jazz style of reedman/composer Sundar Viswanathan at Trane Studio. What we heard was modern composed and improvised jazz mixed with a slight Indian/South Asian influence. "Though it might not be obvious", Sundar announced, the first three tunes they'd play were based on Indian ragas (scales), with the harmony derived from each raga. 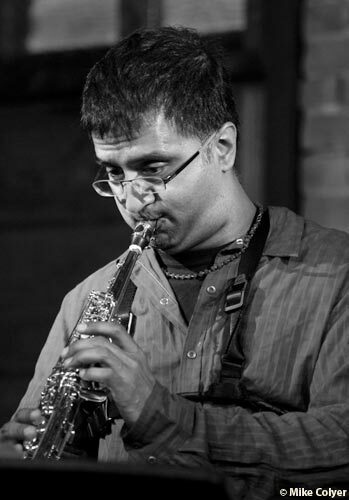 In "Samsara", Sundar was flowing on soprano, whereas Rez Abbasi pushed out textured guitar lines, and when Kelly Jefferson's tenor heated up to altissimo cries, this opened the way for trumpeter Kevin Turcotte's solo, an exciting mix of low note work and rippling, overlapping overtones  brilliant, with drummer Anthony Michelli and bassist Andrew Downing lending their ultra-sensitive and responsive support. "Moksha", the second tune, had a slow autumnal feel. Sundar's alto was all bent and abrupt emotion as the music swelled into a harmonized and spreading fluegelhorn/tenor statement. Downing's bass pizzicato lament was a slow release of pent-up emotions. Guitarist Abassi played it scalar and direct. The third tune, "Ahimsa", was the farthest out of the evening; it started  and ended  with what sounded like a group tune-up that grew into a static wall of sound (or maybe noise, to some). In their solo segments, pianist David Restivo really stretched out and moved the extended chords around while Kevin Turcotte, one of the 'go to guys', soloed in an inventive pattern of high and low trumpet tones. But a night's music, finally, is about sound  what the music sounded like. Thoughts about Sundar's cultural influences, scale patterns, and the titling of tunes, are secondary to the sound coming off the stage. Sometimes the middle section of Sundar's compositions seemed to reduce to a series of routine round-robin solos. Sometimes there were a few longueurs and dry patches in the music, but this is expected on the sometimes slippery slopes of composed/improvised music. But we can happily report that Sundar Viswanathan's musical message this evening was soundly rich and musically engaging. Obviously, we look forward to hearing more from him.